Home / News / Introducing TAYBLES cassette coffee tables and desk! Introducing TAYBLES cassette coffee tables and desk! Choose your mixtape with TAYBLES, the original cassette coffee tables and desk! Regal Robot is proud to carry these outstanding designs by our friends Taylor, Justin and Zach at TAYBLES. We’ve been fans of theirs from the beginning and this creative trio were some of the first people we talked to when looking for amazing pieces of furniture art to carry along side our own designs. Fresh off an incredibly successful Kickstarter campaign, we’re excited to be carrying their “B-Side” series, which they’re offering at an outstanding price. As of this writing, they’ve given Regal Robot the go ahead to offer the coffee tables in three colors at only $300 plus shipping and handling! That’s the same as their discounted post-kickstarter pricing and a limited time offer. Once they close the door on that, the price will shift upward to $350 per coffee table. 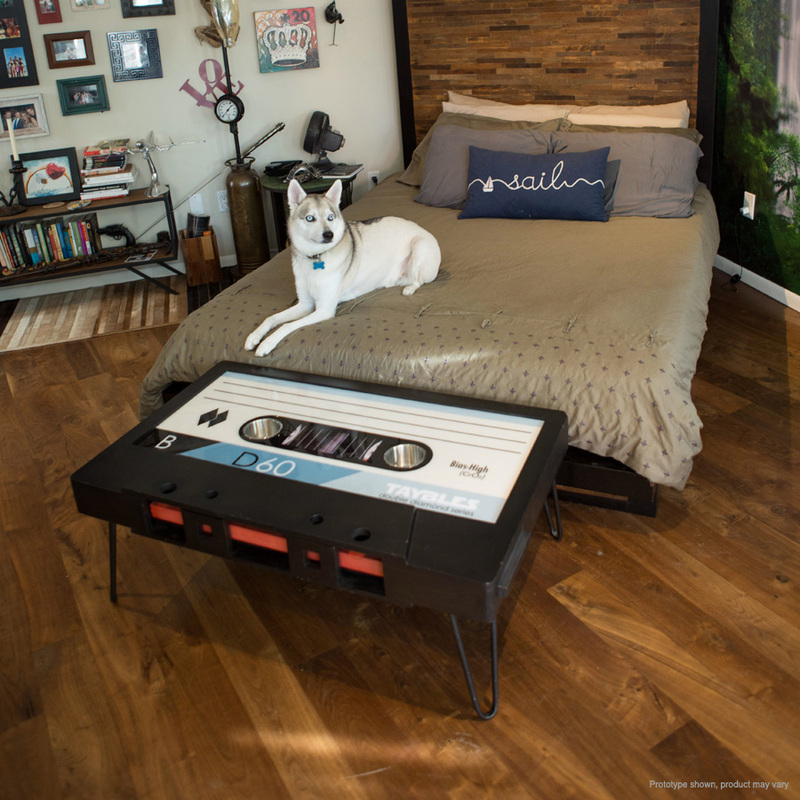 In addition to the retro design which no doubt will spark instant waves of nostalgia in any child of the 80’s, these cassette coffee tables are more than just art pieces. Each table features steel hairpin legs, metal cupholders, and fold down “tape” section which reveals hidden storage within and, best of all, the “label” on this oversized cassette is actually made from dry erase board material so you can personalize things further and change up the mix on your tape whenever you like! 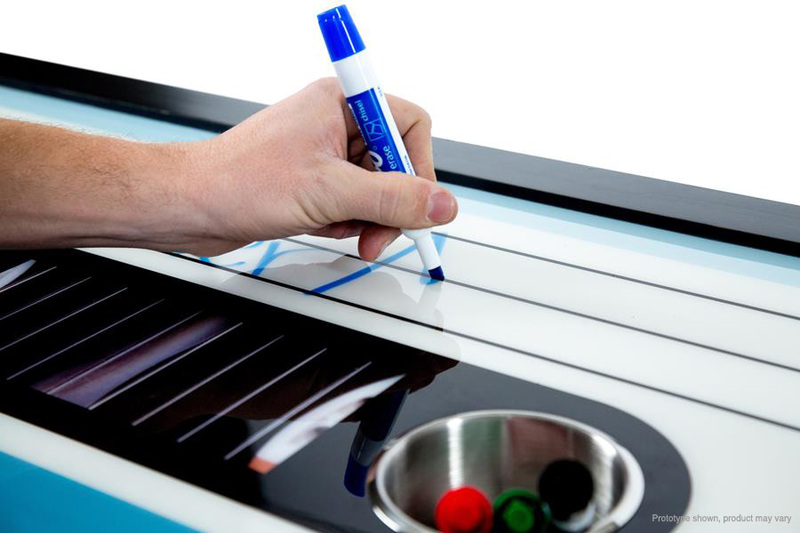 The surface works as a dry erase white board! 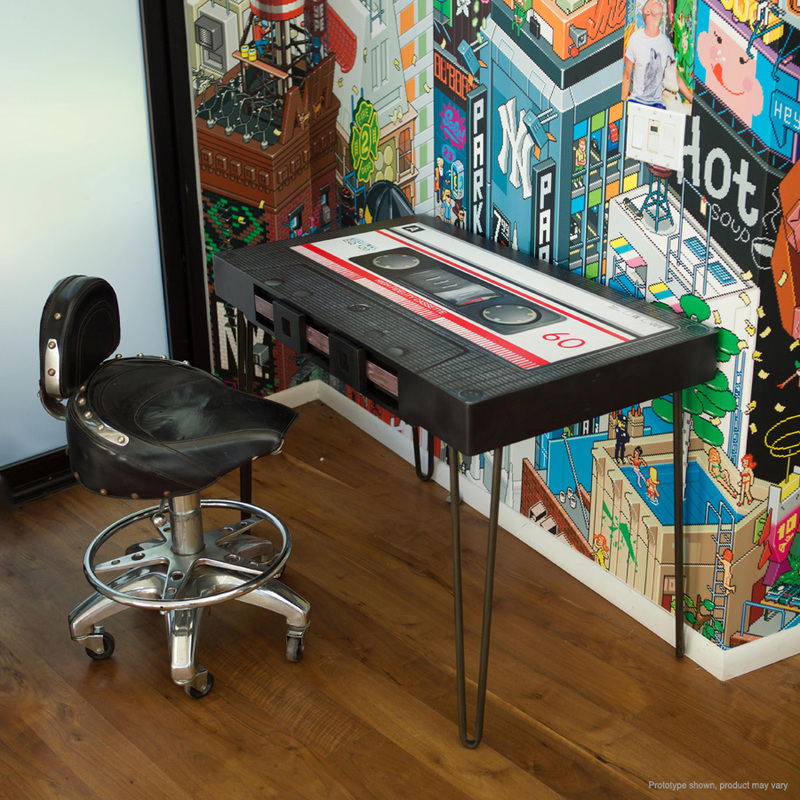 If you’ve already got a coffee table, the Tape Desk may be the thing for you! Similar in style to the cassette coffee tables, this desk features long hairpin legs supporting a giant sized cassette. More streamlined than the coffee table (for the sake of function) this desk features a flat work surface with graphic decal. Unlike the cubby on other models, this one has a functioning drawer to hold your pens, pencils, or maybe even your old mixtapes! We’re absolutely thrilled to be working with our friends at TAYBLES and present these amazing products (and values!) to our clients! You’ll find all of the TAYBLES products on our Other Themed Furniture and Decor page within our online shop. Don’t hesitate to order if you’d like to take advantage of their current, temporary special pricing!